Fiore at the Gardens condos was one of those “hot” communities investors were gobbling up at the height of the residential building boom. Thankfully, the development was built in 2004 and got sold right before the market was on its way down. Besides the strength of the marketplace, the subdivision made perfect sense. First, this newer construction CBS 264 unit condominium community was planned out well. The units are built around Nature preserves and lakes giving homeowners beauty and serenity not often found in such a centrally location position. The location is just prime. Nestled between Military Trail, Hood Rood the locale gives proximity to both PGA Boulevard and Donald Ross. I95 is just minutes away as is access to Palm Beach International Airport, our famous Beaches, shopping at the Palm Beach Gardens Mall. Situated on Myrtlewood Circle, models in Fiore range from 1 bedroom 675 square foot to the 1382 (C1-S) model with sunroom. Views include nature preserve or lake with shimmering fountain. Washer and dryers are standard as is crown molding, true wood cabinetry and volume ceilings. People decide to purchase here because of the ease of lifestyle and the extras. A beautiful community pool, exercise facilities, golf putting green, fun with volleyball, clubhouse with internet access, children’s playground and walking trails are just some of the amenities. Pets are also welcome. Residents are also welcome to have their own private gatherings by making plans with the Property Manager. 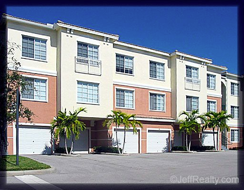 Fiore homeowners association (HOA) is mandatory and takes care of much of your everyday life needs. Lawn care, cable, building insurance, gated security as well as the other extras already mention make Fiore at the Gardens in Palm Beach Gardens such a special place. Posted in palm beach gardens homes, Uncategorized on August 12, 2011 at 11:34 am.